Greetings my Friends – the fact that you are reading these words is we are united in our common search for Truth. As a child I would leave the body at night float around the room and later learn how to overcome the Fear of not being able to return to the body, could travel around the neighbourhood, one night I was found with an open bleeding wound in the bed, another there was a terrible stench. Visits to the lower Astral planes which surround the Physical are not pleasant are to be avoided. The experiences proved to me I was a Spirit in a body that was independent of that body and therefore would never die. What has amazed me over the last 77 years is why is it we accept so readily the belief systems of our bloodline without giving the same due diligence to the answer what happens after Death of the body – as we would to the selection of an Attorney or Doctor or Career. No one seems to care, drifts along in the dream state, not questioning, not wishing to know Fact and happy to swallow nonsense, the subject of Death being socially taboo. Raised in the Country of Australia in the outer New South Wales area of Currabubula and in the City was more drawn by the Spirit of the Bush. Father was a Brigade Major in New Guinea, a warrior, a Boxing Champion, the first European to enter China the UNRA representative at end of World War Two, liberated our POWS from Singapore, later in civilian life a Commander of the British Empire, DSO, a Cambridge Graduate, a man of many Talents was hardened by the battlefields of the Middle East and New Guinea. A Senator at Sydney University, a Vice Chairman of the ABC for 16 years, Author of geography books required reading for High school from 1936 to 1950. He rejected outright Blavatsky and the writers of her time – the eldest Son Kim was a problem – so it was belted out of him to forget the experiences and get on with the Protestant upbringing of Family, Job and Social position. Many years later in the USA became a Metaphysical Minister following membership in a multitude of religious faiths. Metaphysics and mind Control often the first stages of escaping Orthodoxy of Dogmatic Teachings of Church and State an Accountant and Real Estate Tax Specialist had forgotten about the Spirit experiences of youth. Though my search for Truth was always parallel to that of business. My wife now of 49 years and I left Australia in 1974 with a 6-month-old son – Matthew and a 3-year-old Mark. I wanted Mark to count to Five then back to Zero. We four sat on the Living room floor in California – Mark counted to five then back to two – I asked what was before two? He said one like Matthew, then asked what Matthew before one was responded - He was a Spirit! What could he possibly mean, he was only just three? Two more questions followed - If Matthew were a Spirit before he was one where was he? Mark now 46 responds he was with the Gods, note not God. Then the last question – Well what was he doing? Mark looking my lady directly in the eye & responds, - “Matthew was waiting for you to make him a body”. I immediately had a recall of standing next to my mother before I was born, observing then leaving, then returning and a second time as she continued to swell, then next awake in a Bag of fluid, on exiting forgot all. The point becomes if we really do survive Death of the physical body how can we prove it and what and where can we get the answers our Grandparents out Parents, the Church, the state could not give. I knew much about Western and Eastern Religions & Dogmas, but Spirit? The search as a Scientist to prove it one-way or the other began. It had to be totally convincing to a sceptic an investigator - if one could find a Dead person returned or find a way to communicate with the so called dead then I would not wish to speak to another human who had been on the other side a few years. Were their Elders who had thousands of years like a concept of immortality, was their conclusive indisputable evidence of personality survival beyond death, how and what circumstances awaited, was there a Hierarchy of Wisdom available to glean the FACTS. I knew I could not die, I knew there was a purpose to my life if only I could find it. The resultant discovery over many years led to the study of the world of Adepts and Mediums, the belief systems of the Indigenous Tribes prior the white man, could any provide the hard-conclusive Truth of the answer I sought. The mission of the Philosophical Center is to lead and guide you to a new Philosophy, a new alternative to all you have been taught, now in the following I share the LINKS, the evidence and the Truths for you to judge. Ectoplasm a white cheese cloth like substance, unique in odour carried in the blood, with the right conditions and right metabolism a Cleaver, Medium or Adept may act as the vehicle by which the overlapping World of Spirit the so-called dead may cloak self within the ectoplasm flow as a Cloth to be seen in the physical. The blood tested the pulse, a voice box created, communication given, witnessed and recorded and full form physical Materialization occur. 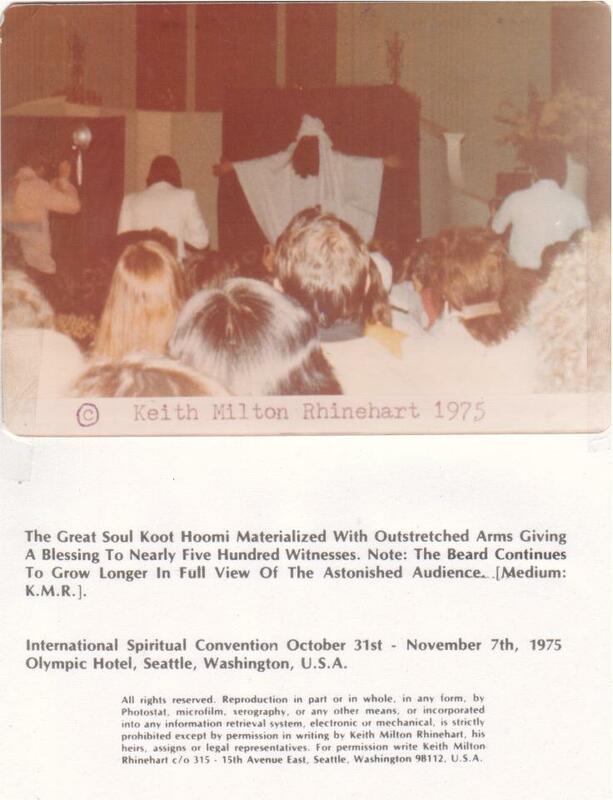 Another form of evidence is that of Apports of Apportation, words rapidly being removed from the Dictionaries of the day-physical items dematerialized from one location on earth and rematerialized in the presence of the Medium during a Séance or Spiritual meeting – pouring forth by the thousands to prove the Power of Spirit over Matta or matter. On page 4 we share several Poems written by the Author to reduce Volumes of Books by condensing into Poetic Word Pictures the salient points which a lengthy Book may take to make. On Page 5 we direct you to a Private Home Study Group on a European Website which requires an identification Email to obtain access. 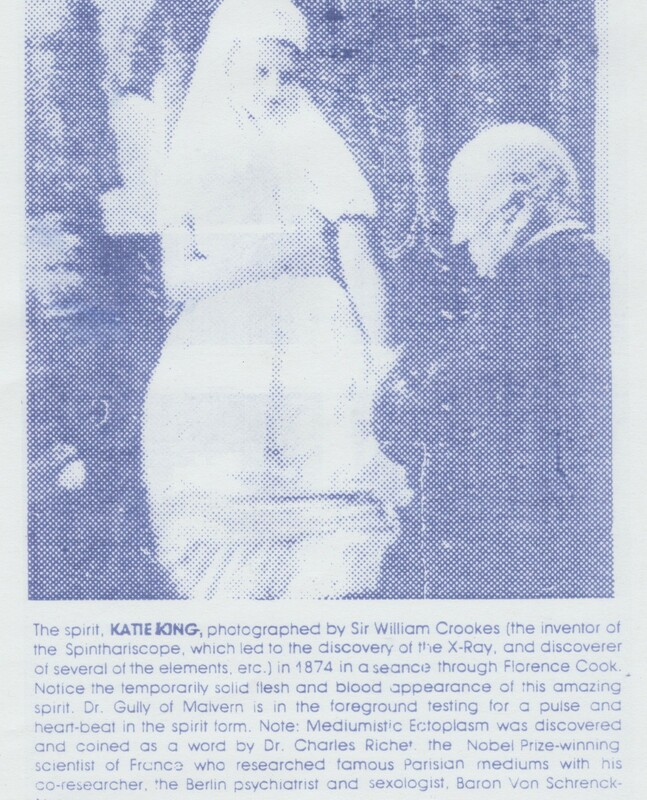 Now follows Evidence of a Spirit World and the ability of a Sensitive or Adept or Medium with an appropriate metabolism in the sanctity of a Séance or Spiritual Meeting which is conducive to the manifestation of Physical Phenomena establishing the Power of Spirit over matta (matter). 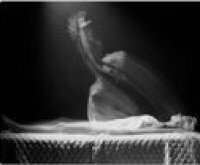 ECTOPLASM – APPORTATION – DIRECT VOICE TRUMPET PHENOMENA – BILLET READINGS (Messages from the so-called Dead to the Mortal living – known as Billet psychometry). Then information supplied is not meant to convince or prove – it is a guideline for each interested person who is reaching out passed the Medieval Religious Philosophies of the past, a step beyond Metaphysical and the common place accepted philosophies into an adventure into an ALTERNATIVE PHILOSOPHY. One based on FACT which also requires FAITH however it is the underlying root of all Religions. The old saying is - “When the Student is Ready the Master will appear” enjoy the journey, reach out to the knowledge contained in the Halls of Internet and make your own Judgement. 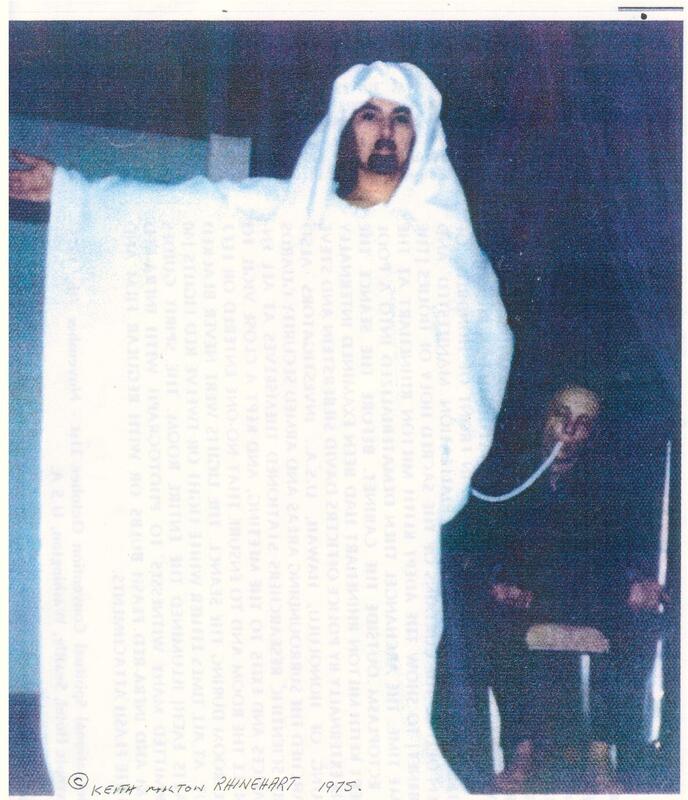 In Master Class in the 70s THE ELDERS taught that White Light has an ACTINIC effect upon Ectoplasm like White Light upon the undeveloped negative of a Film - when the Medium is out of the body the SILKEN CORD (Life Force or Prana) could be interfered with, cut, damaged by such Light and the Medium could be killed or injured as happened in the past. With KMR on Tour I as a Scientific Investigator had the task to protect the Medium, to secure the Chapel, secure the Doors climb under the floor via the Basement into the Attic and examine the solidarity of the Brick walls behind the Cabinet, Holy of Holies, Sacred Area etc. 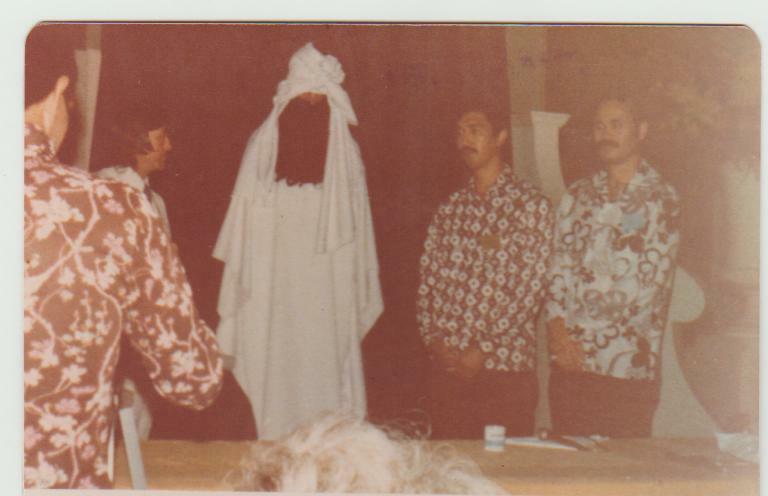 I would search the sitters physically and remove watches, cameras and stop some sceptical idiot from using a Flash camera IN THE MIDDLE OF THE séance. Strictest of Scientific conditions were imposed. Perhaps you have read a Grandfathers Affirmation available and to be attached to the following enclosed Affidavit and Statutory Declaration AT THE CLOSE? 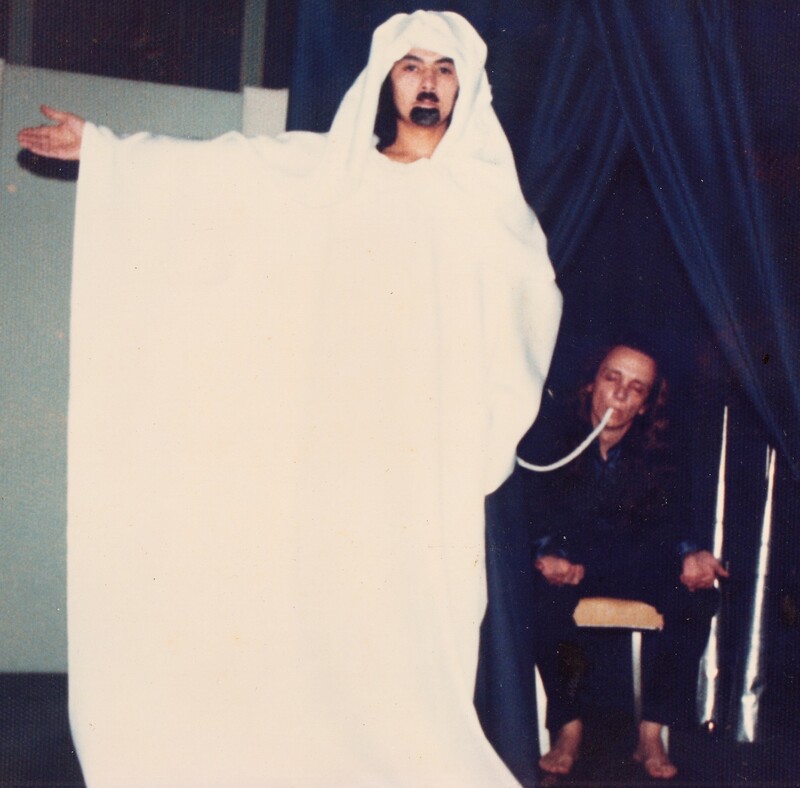 At one Séance in the 1980s’ the Master - one of the Buddhas stepped out of the Ectoplasm and sat before me as we recorded his words - then he stepped back into the Ectoplasm and slowly dematerialized before our eyes. AF has the collection of Phenomenon of the 50s to 90s that prove beyond doubt the Veracity of the incredible Phenomena. In the past we have relied upon research such as Katie King and that of Baron Von Schenck Notzing and other from the 1800s. SPECTRUM - CYRIL PERMUTT; THE SUN DANCE PEOPLE - THE PLAINS INDIANS, PAST & PRESENT - RICHARD ERDOES., GHOSTS IN PHOTOGRAPHS - THE EXTRAORDINARY STORY OF SPIRIT PHOTOGRAPHY - FRED GETTINGS. When our sons were early teens we were in the Chapel - at the far end of the 8,000 sq. 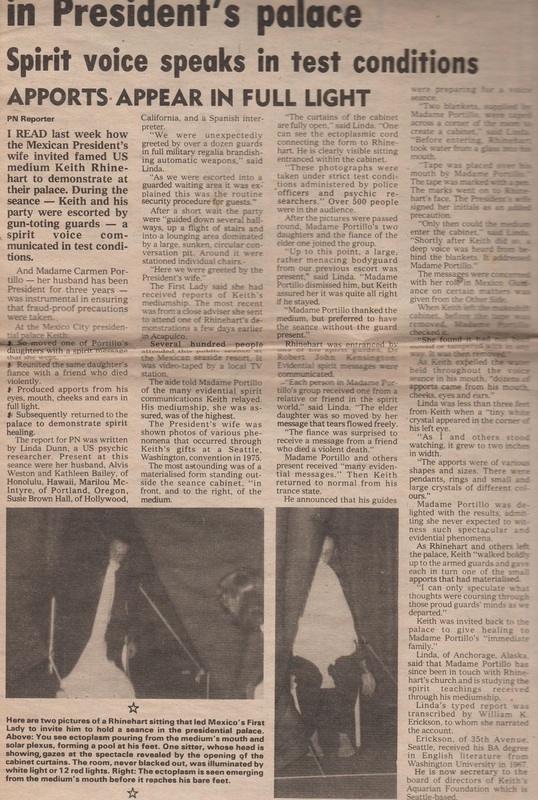 ft home I built in my 38th year in Evergreen Colorado - we heard a loud crash - we rushed to the Laundry - the Washing Machine jammed tight against the Dryer packed tight in the room had been picked up - turned around to face into the room the two hoses and power leads still connected? We had neglected to make peace and ask permission of the Indian Chiefs buried long ago upon this utopia, upon which we as ignorant white man had built our Home. At another time in the Guest Bathroom I stood with the door open staring into my own eyes in the Mirror - had a Sacred Mushroom inside me - the Guests in the adjacent room jumped to their feet at the sound of objects hitting the wooden floor and bouncing out the opened door way. We had not laid Carpet yet - and the guests witnessed DOG CHOW PELLETS materializing between myself and the mirror flying over my shoulder onto the floor by the hundreds. Later that night I invoked Goloka from Garuda against instructions not to. Out in the moonlight upon our deck a large Lizard Man with scales and penetrating eyes materialized before me and gave me some stern Soul shaking warnings. Another time earlier in the 70s in Santa Anna California I studied ‘Pyramidology’ by Patrick Flanagan and built a light Pyramid out of 1/2-inch-thick sticks in the middle of our Living room - entered Meditation - my wife observed my cross-legged body raise some 6 inches off the floor. 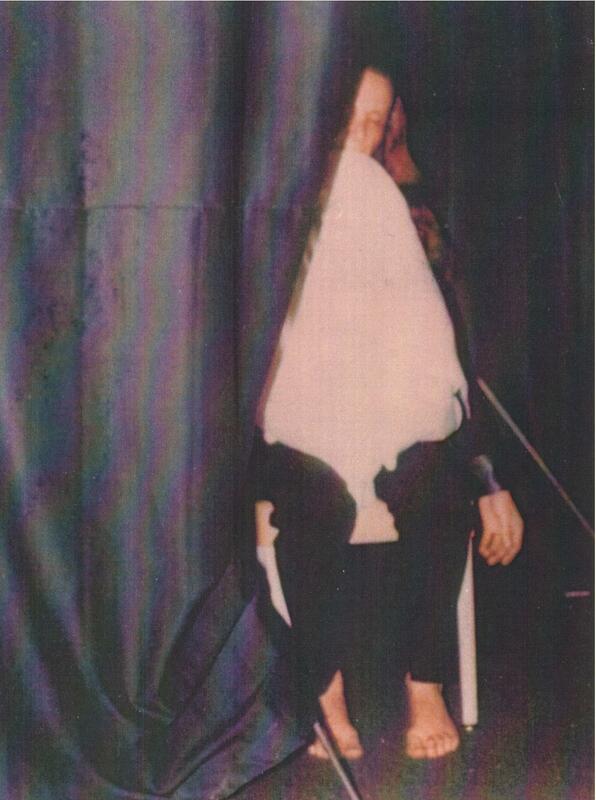 Another time my Body grew, I am 6ft 3in and the Height was about 8 Feet, this was in Colorado - my frightened Wife and the witnesses begged me to stop and return as I started to fade physically – Lady Cherie was terrified for her Husband and Soul Mate appeared to be growing fading and departing. 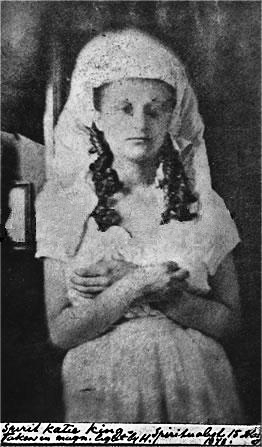 Abraham & Mrs Lincoln were Spiritualists, a young girl famous in History would lie upon a Table – Ectoplasm flowed from her Lower areas and body openings and a hand and arm would materialize Flesh and Blood and write answers to questions on a Paper Pad placed upon her tummy. 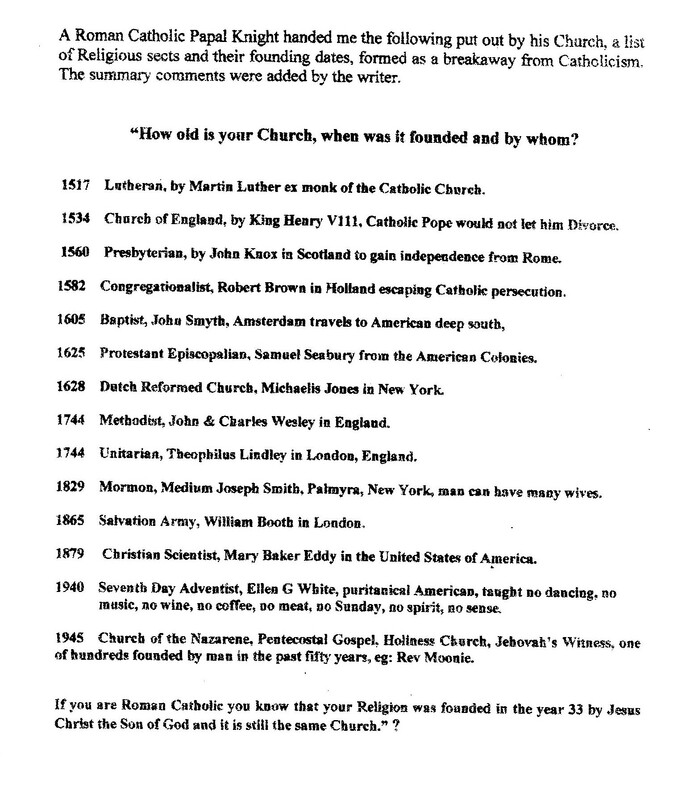 Perhaps that is the source of the forgotten and changed American Declarations. 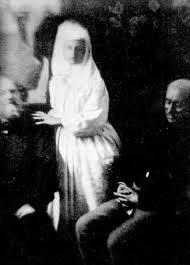 When the little Girl in the History of Catholic Dogma would enter the darkness of the cave that which is referred to in the Christian Scriptures as WHITE CLOUDS would pour forth and the Spirit world would come to her, research FATIMA and Padre Peoe and others. The Evil Empire of Rome has done her best for over two thousand years to cover Truth of your individual survival with dogma and superstition. The absolute lies of the Jews and their claims to the Holy Lands are based upon the dishonesty of previous chains of Rabbis who would rewrite their own self-serving History and fabric of Untruths to claim the so called Holy Lands. One man destroyed an entire Civilization in Egypt as he led the Merchants and Bankers and the emotionally charged out of the City. If a god spoke to me from a burning bush and proclaimed I must kill my first born to prove my Faith I would urinate upon the bush. One evil Rabbi led the scattered Tribes lost and never found into the ongoing wilderness of nonsense in which they now dwell – imposing their unfounded claims upon an ignorant world. Control the Media and all you think and do – the mass swallow Camels and choke upon gnats. In Master Class we were taught “AFTER THE PHENOMENON - THEN WHAT" - the Mission is to work ceaselessly for the whole of mankind to bring the knowledge of Past Death survival to a world in chaos. Don't look for Sanity in an Insane Asylum - Souls who bugger up elsewhere are sent to the Insane Asylum of the local Universe - 'Planet Earth'. I personally think - "I got off the wrong bus"
Read how Mark our first born aged three stated: His brother Matthew before he was aged one was a Spirit with God waiting for Mummy to make him a body. I took all the photos in the attached post card under Apports and created it for AF. Red stones materializing in the flowing blood from the opening wounds in the palms of the outstretched hands, the Atlantean Mind Stone oozing from KMR's forehead in the Light - dropping to the top of the Piano where Count St. Germain having entranced KMR played the Ascension Symphony. 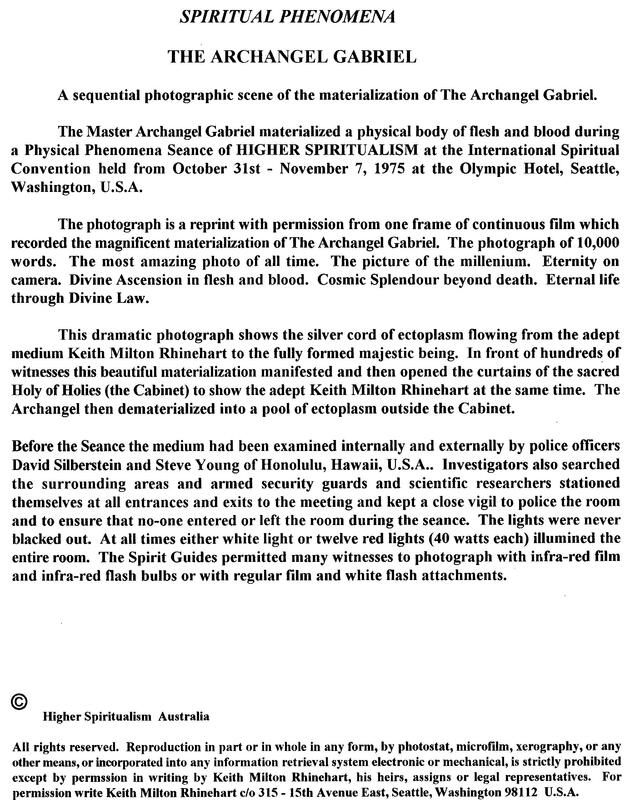 If you can find them check out the videos I have posted on the Internet - all the Objects were materialized during Séances in white Light or as in some cases were in the Guru’s House in Seattle - I purchased them at outrageous prices to help Anchor the Light by allowing AF to purchase Real Estate and pay their Spiritual Leaders. If you create absolute Black Out conditions, which is not an easy Task and you have the Right & Correct motives, you with your Sitters exercise the intelligent informed controls, you will experience so called Phenomenon. 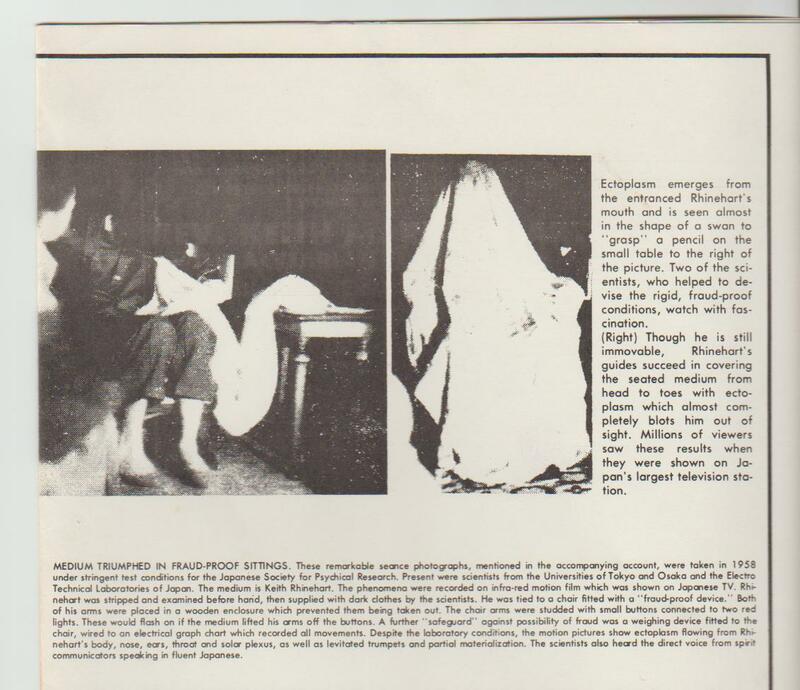 The Spirit world will draw Ectoplasm from those present and you will experience CONTACT with the world loosely described as Spirit – some sitters will see nothing other forms moving about the Séance Room. 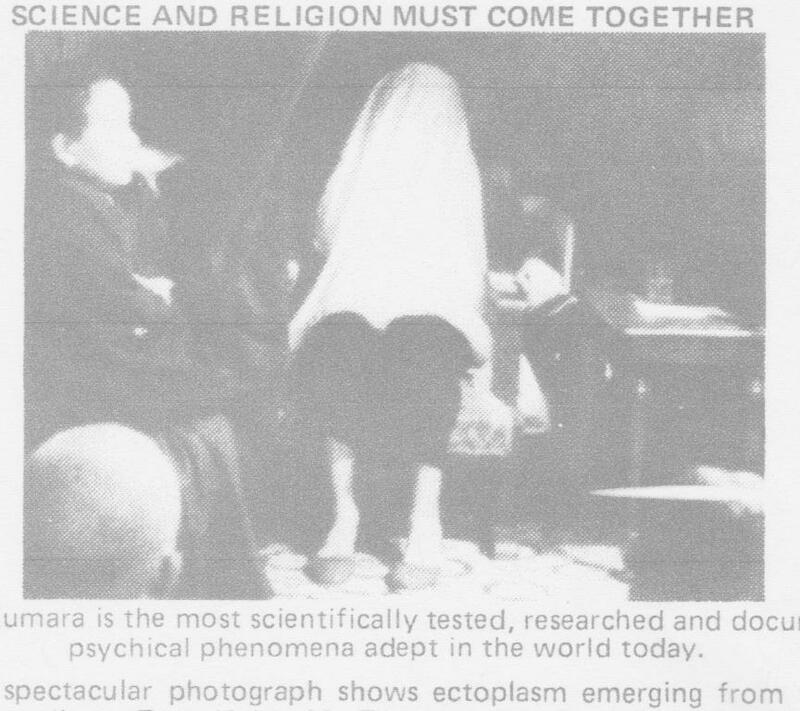 Raise the Vibrations in the Euclidic Presence of God within the Séance Chapel you create, and you will see physically in the Black out conditions what is known as Phenomenon. Black out must be total – a Basement room with no windows and air flow without Light and a door that is totally sealed to prevent Light is difficult. Go unto the Mountain away from the electrical impulse of Man’s creations look into the Stars and when your eyes adjust you will see the Alphabet Letters the star Paths from the Saucepan to the Pleiades and so on – God luck. Search the stolen plagiarized Scriptures of the Christian holy (full of holes and aptly named) Bibles and you will find the hundreds of references to the mineral Kingdom, the Stones, the White cloud or ectoplasm as Dr. Charles Richet coined the word. In the Poetry of 'VEDANTA' and of ‘ASK – The Tree of Knowledge’ at www.aspiritspeaks you will find 50 years of study of Master Teachings and from before your recent Birth, of Master consciousness condensed into word pictures to Heal the Soul. So, you have had but a soupcon of my experience, the Family of Sri Sunkara Sankacharya son of Soma has paid the price over and over. Share all this as you can with the world I have another 40 or so Videos I need to, make TIME is of the Essence. For God's time for Planet Earth is slipping by. Love in Service - LIVING THE LAW OF LOVE IN ACTION. Interesting to note that over the main door into the UN building in New York we all see on TV there is a large high wooden sign “SÉANCE ROOM” from the days of Abraham Lincoln a Spiritualist – a young girl would come into the Room lay face up and from her genitalia under a cloth an Ectoplasmic stream would flow up her tummy a hand with fingers would write directions on a pad and then dematerialize into the orifice – similar to the image you will see of a Medium KMR in Japan under Scientific test Fraud Proof conditions – all you will experience on this site is to direct you to further Study. PHOTOGRAPHING THE SPIRIT WORLD -Images from Beyond the Spectrum by Cyril Permutt. 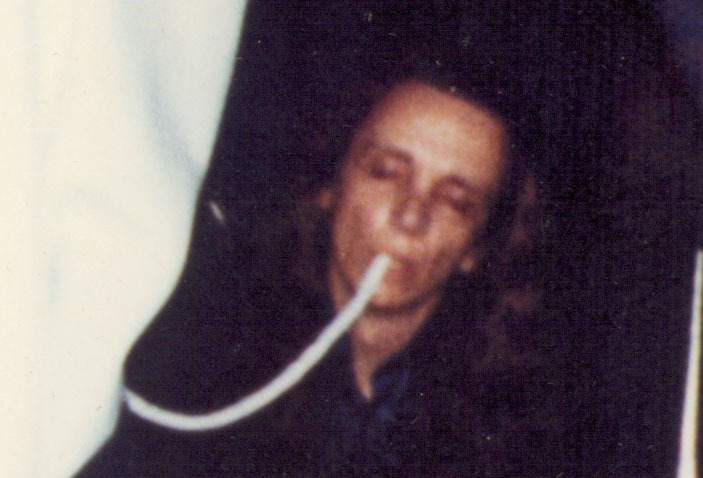 The word Ectoplasm does not appear in The Concise Oxford English Dictionary – In WEBSTER’S NEW WORLD DICTIONARY OF THE AMERICAN LANGAUGE – Is Defined as: the outer layer of the cytoplasm of a cell; the vaporous, luminous substance supposed to emanate from the medium during a spiritualist trance. The author underlines the word supposed because it is a DOUBT word deliberately placed by the authors of Webster’s and other words pertaining to Spiritualism to plant a doubt or questionable word in front of all words you need to know about the Truth of your Dual existence of Spirt being in a Physical form-to discredit as the authors are of Orthodox Religion. Visit the Web Site www.hispirit.org.au note the SPIRITUAL REVELATION SUMMARY Lesson # 97 – Spiritual glossary of Terms – the 65 Spiritual Revelations are complimentary – simply email a request to hi.spirit. The Beard continued to grow in the full white Light.